Final Update, 2:53 p.m.: The vehicle and debris has been removed from both tracks with all train service being restored. Customers can expect residual delays through 3:45 p.m. as we work to get trains back on normal schedule. Gold Line trains are currently running between Atlantic Station and Southwest Museum Station. Trains are also running between Highland Park and APU/Citrus College stations. 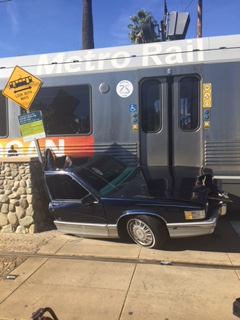 The accident occurred in Highland Park, where the trains run down the middle of Marmion Way. The accident occurred about 1 p.m. and we’re working to restore service for the busier hours later this afternoon. Please follow our main Twitter feed or service alert Twitter feed for frequent updates. I post this photo as yet another reminder to be careful driving, walking, biking and skateboarding around railroad tracks. Thankfully there were no serious injuries. It looks like things got a little toasty when they tried to untangle this mess. Don’t tarnish those P2550’s! That’s why you should put the gate and alarm bell on each level crossing, don’t be lazy to do that please!